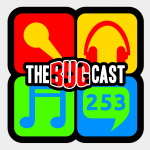 the bugcast 253 – It’s our 5th birthday!!! This week, as we celebrate our 5th anniversary, we have a silly quiz with our live listeners, and we play 8 great pieces of music. The next show will be episode 254, which will be broadcast live in the chatroom on Friday 15 March 2013 from 21:30 UK time.